Chia seeds are high in calcium, phosphorus, magnesium, manganese, copper, iron, molybdenum, niacin, and zinc. Inspired by the shape of Italian Biscotti, these gourmet sticks are easy to hold for most parrot species. 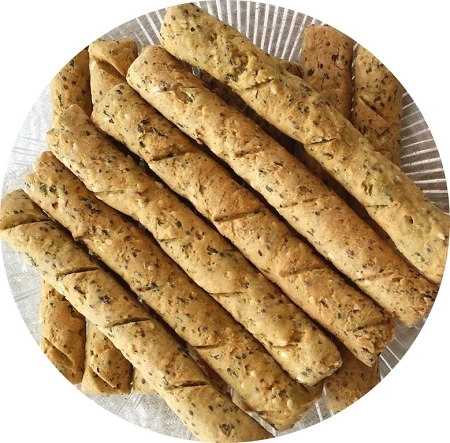 Tasty treat sticks feature Chia seeds, sesame seeds, fresh organic kale and pureed pumpkin. A source of omega-3 fatty acids, Chia seeds also offer Vitamin A and various minerals. Ginger powder gives these crunchy treats a slightly pungent flavor. Sold in packs of 10 large sticks. KAMUT® Brand flour, Chia seeds, sesame seeds, kale, pumpkin puree, coconut oil, dandelion, ginger.